I work almost every day. And by every day I mean every day. The problem is that it doesn’t feel like work. I wish I didn’t even have to call it that. I feel like the word work implies negativity and I love what I do. I do however try and break up the week by shifting focus on the weekends. If I come in on the weekends I try to focus on quieter, less physical tasks to help me prep for the upcoming week. I’m cleaning the shop, organizing work spaces, working on digital media like this. I don’t want to go home tired or dirty. One task I enjoy doing but only seem to get to occasionally is spiffing up my work boots. I’ve spent my entire life working on my feet. 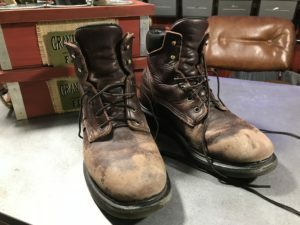 I’d never spent more than $30 on a pair of work shoes or boots. My logic was simple. Buy cheap shoes and replace them often. I knew work boots were uncomfortable no matter how much you spent so why drop a fortune on them. Besides, I hated most of my jobs so why would I want to dump a paycheck back into them? Well, no one said I was smart. Dumbest logic EVER! 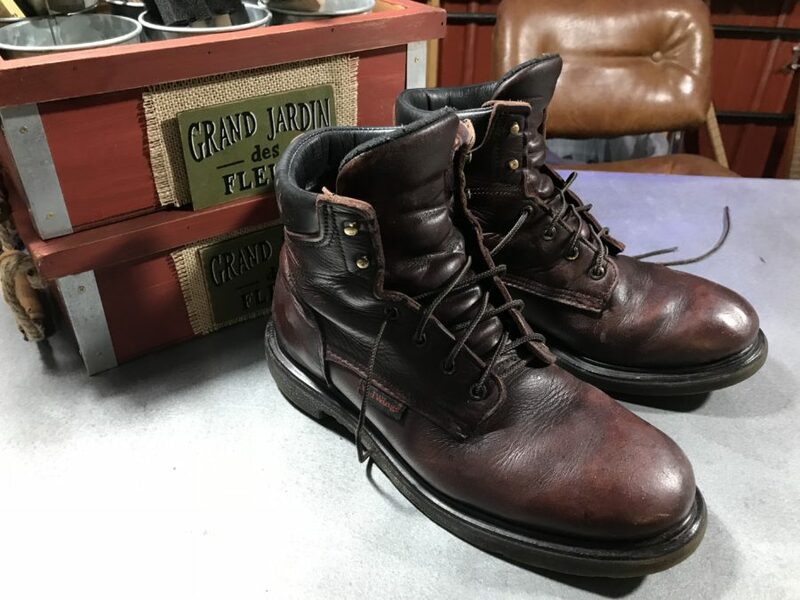 A few years ago I stumbled into a Redwing shoe store with my wife. I wanted to see what went into a good shoe so I’d know what I was looking for in a cheaper one. I listened politely to the saleswoman but was still doubtful when I put the boots on. They were like slipping into a second skin. Heaven made from leather! I immediately regretted not looking into this years earlier. I balked at the price. My wife, typically as frugal as they come, told me to buy them without flinching. She pointed out that if they were actually comfortable I’d wear them every day of the year and even if I had to replace them yearly it would be .75 cents a day at best. We had no money and yet she was telling me it was a good idea. Wives are smart that way. The saleswoman saw my dilemma and discreetly gave me a 20% off friends and family price which helped more than I wanted to admit. Thank you kind lady. That was 3 + years ago and I have worn the boots almost every single day since then. My wife is sick of looking at them. She might as well get used to them because they are really showing no signs of real wear or tear at this point either. The soles will eventually wear out but even then I can send them back to be resoled for about $100 bucks. My guess is that I will die with my boots on!